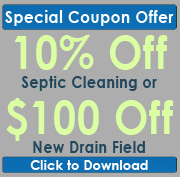 First and foremost, be aware of how well your septic system is functioning. Although you’re not able to see the physical state of your septic system, pay close attention to warning signs that something is not working correctly. As soon as you start to notice issues like slow drains, bad odors, lush grass around your drain field, or other telling signs that the septic system is not working well, contact a professional. Describe any concerns that you have to the contractor and have us come out to inspect your septic system as soon as possible. By providing our services right away, we’ll be able to help you avoid major issues that could develop if septic services are avoided or put off. Once we’ve completed our evaluation, listen to our recommendations. We will help you put together a plan to get everything in good condition again. We will share our insights about the residential septic services that you need. There are certain residential septic services that need to be scheduled routinely. Regardless of whether you’re experiencing any major problems, hire a professional to provide these services, so that you don’t end up with serious, sewer-related emergencies. Use this guide to help you know when to schedule residential septic services and to understand what to expect from that process.